I wanted to try and gauge interest for an Evo Meet in or around the Market Place in Tustin. The primary goal of this meet would be about having a cool laid back environment to talk about our cars and to better establish a network of fellow Evo owners. This might mean just hang out at the meet, be able to help people out working on each others cars, plan track days, auto-x or drag racing days. What I wouldn't want this meet to be is just another street race ricer meet, there already seem to be too many of those! No huge groups leaving the meet to go race and record on video and post to social media, calling people out to race, revving your engine or just being a douche bag. Anyways, if there is an interest in like minded people then I think this could be a good meet! Post any suggestions or comments you might have! 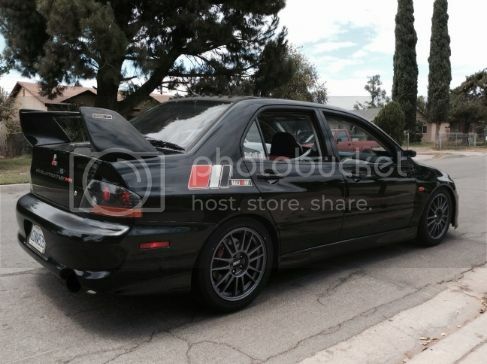 Update: 'SoCal Tustin Evo Meet' is a First Saturday of every Month! Last edited by RC10EVOX; 02-04-2016 at 03:30 PM. I would be down for something like this on a Friday. how often do you think it should be held? I think weekly usually draws a smaller crowd from what ive seen in recent years. I think Bi- weekly would be cool and a bump of the thread for that weeks meet would help with the confusion. I'm down to try and get something started. I'm sure EdiREvo8 is down too. We tried having a weekly meet in Orange off the 55 and that pretty much failed but, I'm always down for a regular meet. Good point Macky! I think at most bi-weekly, just because it is nice to have Fridays and Saturday open from time to time. The only problem I see with bi-weekly meets is that it is easy to mix up which week the meet is, but I wouldn't mind a bi-weekly meet. I at least think a first Friday or Saturday type of thing is easy to remember? dont do first friday, i cant make those lol. second friday maybe. bi-weekly is perfect that way people can make plans on one weekend and go the meet the next. hey i know i dont always have something to do on a Saturday night.. best of luck! I'm fine with either Friday or Saturday, and have only been considering Friday more per Macky's request. However, depending on what most people want is what we'll do. So far it sounds like Bi-weekly is the way to go, and as this gets more traction I can create a FB group as well for invites and staying informed more easily. To be honest it doesn't bother me if it is on Firday and conflicts with the El toro meet. I've been going to that meet for a long time and I'm kinda over it, besides most of the people that go to that meet would rather street race anyways and that's not the crowd I would like to attract anyways. So I think it would all work out. I think it's starting on the first Saturday of Nov. So how many people are going? Or who? Lol, I'm sure I'm one of them! I live on Irvine Blvd and in my complex alone there are two other Evo X's (5 months ago there was another X and IX as well). Along with some friends that live in the immediate area, so definitely lots of Evo's in this area! @EdiRevo8, thanks for the input! Fa sho. If you sign up and don't show, you get gangbanged by Rawger and EdiREvo8 lmao. Hellz yeah, can't wait to meet with fellow Evo owners. First meet, how exciting.....Wait, is there some sort of gangbang initiation I should know about, because I liked to be kissed before I get F*%ked. lmao.....just threw in my cosworth drop in filter. Came just in time.